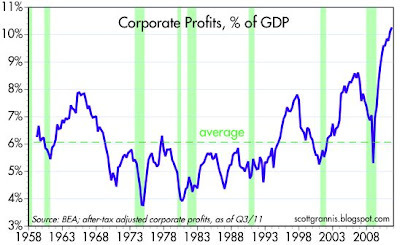 I've showed this chart many times over the past several years, usually in the context of how impressive the growth in profits has been since the late 1990s, and usually with the observation that despite all this profits growth, equity prices are almost unchanged. To be specific: since October 1999, corporate profits after taxes have increased 160%, yet the S&P 500 index is unchanged. Many readers and analysts have argued that this is no anomaly, since the market is simply figuring that corporate profits will soon revert to their mean relative to GDP (6%); that the burst of profits in recent years is only transitory. My own valuation models confirm this: I think the market is priced to the assumption that Treasury yields rise significantly and corporate profits decline to 6% of GDP in the next 3-5 years. I've argued that since this is such a pessimistic assumption, there is plenty of room to be optimistic. Skeptics have argued that corporate profits can't possibly remain as strong relative to GDP as they are today, much less continue to increase, and that they must decline significantly in the years to come. Now, reader "WimpyInvestor" has asked a question that bears looking into: "if US corporations are serving global customers, then shouldn't the denominator be changed to Global GDP?" And indeed I think he is right. The increasing globalization of world commerce has brought with it spectacular opportunities for companies to expand their addressable market. Apple is a prime example, since it can sell the same iPhone all over the world, and the global cell phone market is now over 6 billion in size, compared to less than a billion not too many years ago. Hollywood is another example of an industry that can now sell its products to billions of customers, whereas the movie-watching market was less than a billion a decade or so ago. It no longer makes sense to compare the profits of U.S. corporations to U.S. GDP, since that arbitrarily limits the effective size of the market our corporations operate in. It's time to go global in our thinking. Never before have companies been able to market their products so easily to such a huge and rapidly growing global market. And so I've put together the above chart, which compares the same measure of corporate profits (after-tax adjusted corporate profits according to the National Income and Product Accounts, which includes income from foreign sources) to World GDP as calculated by the World Bank. (I've made a conservative estimate of world GDP for 2011.) Now we see that corporate profits aren't really so high after all. When we consider that many U.S. corporations now have significant exposure to global markets, profits relative to world GDP are only slightly higher today than they have been on average over the past 50 years. A reversion to the mean might occur over the next two years without any decline at all in nominal profits; for example, profits could continue to increase by 5% a year, but global GDP is likely to increase by even more (e.g., nominal GDP growth in China and India is likely to be in double-digit territory). I think this adds up to one more, and very good, reason to think that the U.S. equity market is being way too pessimistic in its outlook for corporate profits. Interesting and makes sense if US corporations were taking a lion's share of global markets. Unfortunately, my guess is we are losing market share to foreign companies (for example, I would be shocked if Chinese companies weren't taking market share of the Chinese market for most industries). So, the apples to apples comparison would be total global profits as a percent of total global GDP. Not sure that info is available. Profitability is improving at global firms, which is exciting -- I can see an entire layer of commerce that is about to displace nationalized commerce in the coming decades -- in fact, the future of national firms is suspect at best as globalized companies seek to decouple their futures from exploitive nation states (such as the US) who tend to loot corporations via taxes and tribute -- in fact, the growth of highly profitable "stateless" corporations could spell the demise of nation states as we know them -- imagine how quickly US corporations will abandon the US in order to take advantage of new domciles in countries that have no taxes, police and military forces dedicated to defending corporate interests exclusively, harsh labor laws, and abundant natural resources -- I can imagine companies jumping from country to country with their manufacturing and service operations based on who is offering the best deal at the time -- yes, profitability is improving at global firms precisely because global firms are increasingly determined to decouple their operations from that of the nation states that have historically exploited corporations in years past -- I am very excited about dividend paying stocks issued by the world's largest firms -- now is the time to buy cheap equities while maintaining a 25-35 year investment horizon! You think Chinese airlines are buying Chinese planes? Are Chinese power plants using Chinese turbines? Sure, they're using Chinese steel, but where are the fatter margins, in the steel or in the planes?? Do the Chinese haul their coal and whatnot in the Chinese version of the Caterpillar 797? Doubtful. "Interesting and makes sense if US corporations were taking a lion's share of global markets." I don't see what this caveat has to do with Scott's argument. It is well known that GM now sells more vehicles in China than in the US. Porsche's sales are now larger in China than in the US. Likewise the sales of John Deere and Caterpillar to emerging markets are growing smartly and they are building factories there: Deere will soon have 11 plants in China. Those sales represent growth and profit for S&P 500 US companies. 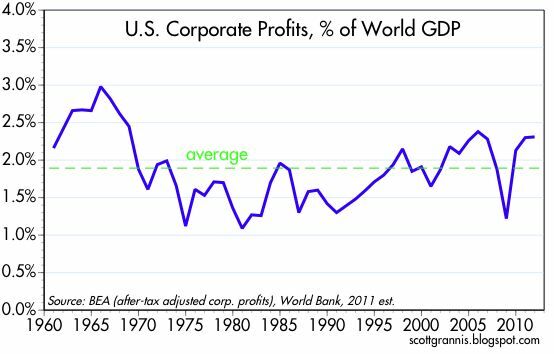 The only new point I would make is that the recent slow growth of US GDP makes the rising global (total) profits of U S companies appear strikingly high as a percent of GDP in 2010 and 2011. Along the same line, and a kind of a "have your cake and eat it too", American corporations bring global diversification without the need to own foreign stocks. Bullishness on the Emerging Markets and the desire to diversify can bring you to purchase large cap US stocks. Fantastic chart Scott Grannis! I have made this argument to people who have made the profit margin reversion to mean argument to me, but I was too lazy to put together the data. Thank you! Thanks for creating the new chart and starting the discussion here. Very helpful. 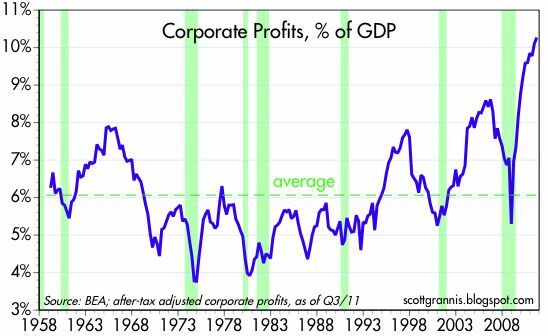 Another "quick" question: in the previous "mean reversion" cycles of corporate profit margins, what were the main drivers? Are they always the same in each down cycle? External shock to economy -> product demand drops -> lower sales or lower prices -> lower corporate revenues ... but corporations in the "old days" had high fixed costs (plants and factories) and long-term labor contracts (pensions & other obligations), so couldn't reduce costs "overnight" to adapt to lower demand ... thus, the declining profit margin. What happens in today's globalized, technology driven world? 1. Labor flexibility -- temporary workforce / contractors, even full time employees can be laid off pretty quickly ("at-will employees in CA"), outsourcing to lower cost operations (engineers in China, India, Ireland, Chile readily available), 401(k) vs. pensions, etc. 2. Lower fixed cost businesses -- Amazon Web Service / cloud computing / pay-as-you-go vs. heavy hardware expenditures. 3. Virtual workplaces -- no need to close office spaces as more and more people work from home. Also, would it be useful to isolate the profit margin declines from financial vs. non-financial firms? The big drop in 2007-2009 cycle was clearly increase in banks' loan loss reserves. Appreciate all your work here.